Rock n’ roll is a story of many survivors. Obviously making a career out of playing live, and recording music might sound glamorous, but there are many setbacks musicians have to endure. When times are good, money and fame make people think that they are living a charmed life, but once that ends, and in the majority of cases, it does and quite quickly, then the uglier side of this lifestyle rears its head. Living on the road to pay the bills takes a toll on a musician, and when alcohol and drugs kick in, it starts to get really rough. When an artist goes down this rabbit hole and does not wake up in time, he may follow in the steps of many very talented people we have sadly lost over the years, one example being the legendary front man of Irish rock legends Thin Lizzy — Phil Lynott. But for every such story, there are stories of rock n’ roll survivors. One of them is Ricky Warwick, the man behind the semi-successful Scottish ’90s rockers, The Almighty. Warwick had his time in the spotlight at the beginning and somehow into the mid ’90s, but then as fame faded away, the rock n’ roll rough road started, with all the dinky clubs the band had to move to from arenas, and substance abuse. Warwick however managed to get his act together and resurfaced sometime ago as the lead singer of the reformed Thin Lizzy, sans Lynott but with most of the latter’s former partners in crime — guitarist Scott Gorham, keyboard player Darren Wharton and drummer Brian Downey. The band, which was lacking Lynott who was its main driving force in its heyday, was deemed by many of the fans as the closest thing to reality albeit still a bit of a cover act. After some time of playing live shows, the gentlemen decided to record some music, but at the same time decided to stay fair to Thin Lizzy’s trademark and rebranded the band as Black Star Riders. Since then, they recorded two very solid albums, All Hell Breaks Loose and The Killer Instinct, which blended a sound very reminiscent of old school Lizzy (granted Gorham was aside from Lynott, a main contributor to songs on Thin Lizzy‘s efforts), and Warwick’s quite unique, very honest songwriting. 2017 brought up a new release by this band, and all I can say is that it follows in the solid hard rock footsteps of their previous releases. Black Star Riders deliver an honest, gritty rock effort. The songs here continue to combine Gorham‘s signature, very Lizzy-like playing with Warwick‘s aforementioned very honest lyrical delivery. After a few listens of songs such as “When The Night Comes In,” “Thinking About You Could Get Me Killed,” “Dancing With The Wrong Girl” and the very catchy title track, they immediately stick in your head and stay there quite a while. This is not a record that needs to grow on you. It hits off with a listener very quickly. The interesting thing is that the majority of the record, songwriting wise, is a collaboration between Warwick and guitarist Damon Johnson. I was surprised that the only songs Gorham contributed were the title track and “True Blue Kid.” There is one track when even the bassist, the man who has seemingly played in almost all reunited ’80s LA rock acts, Robbie Crane has a writing credit. All in all, although it seems for the most part a Warwick/Johnson written record, it has its Thin Lizzy vibe all around it. So the style stayed pretty much the same as in the band’s previous releases. As with Black Star Riders‘ previous releases, there does not seem to be a really standout weak track here. In my opinion, all of them are solid. Maybe one of the softer ones, “Cold War Love,” does not hit with me as strong as all the others, but it is just because the others are really strong efforts and this one just plain good. All in all, this record is one of the finest releases I heard this year so far. Of what I know, chart wise it is the best one for the band so far, hitting the sixth spot on the UK charts in January. I know a lot of people may put this band down as an act which does not evolve in any way, but at the same time if the formula is fine, why change it? Heavy Fire is a good solid record in my opinion by a bunch of true rock survivors. I dig this record. My guess would be that Lynott would too, and the majority of rock fans out there will also be pleased. Thumbs up! BLACK STAR RIDERS’ new track “When The Night Comes In” from third album, Heavy Fire, out worldwide. Purchase, download and stream at http://nuclearblast.com/bsr-heavyfire. 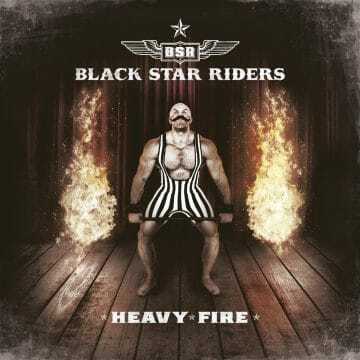 The title track from Black Star Riders’ third studio album, Heavy Fire, out worldwide via Nuclear Blast Entertainment. Purchase, download and stream at http://nuclearblast.com/bsr-heavyfire.